BERLIN, Sept. 4, 2013 – Ford Motor Company announced today at IFA 2013 that it will kick off the sale of its new Ford EcoSport on Facebook® with a special ‘Limited Edition’* version of the small smart utility vehicle. 500 ‘Limited Editions’* will be available across Europe with just 120 right-hand-drive models for the UK market. It will feature the Ford SYNC AppLink system – which enables voice control of smartphone apps from the driver’s seat – as part of a special equipment package that also adds 17in alloy wheels, leather trim, and an array of advanced technologies. Later this month, Ford will announce an additional special bundle of apps from its SYNC AppLink partners for the EcoSport ‘Limited Edition’*, including 12 months of unlimited audio book downloads from Audioteka direct to the car. Customers can reserve their Panther Black Titanium ‘Limited Edition’* priced from £16,995 on a dedicated website by following a link from Facebook®. They will be able to choose between a 125PS 1.0-litre EcoBoost engine – the International Engine of the Year for 2013 and 2012 – or a 91PS 1.5-litre diesel engine. The ordering process can be completed at any of the UK’s 530 official Ford dealers upon receipt of a special reservation voucher. Ford EcoSport delivers the agility and fuel efficiency of a small family car, with greater flexibility, and a comfortable high-command driving position. The large front grille, short bonnet and raked front pillars create a sporty and contemporary feel, and angular headlamps reinforce its modern lines. Following the ‘Limited Edition’* launch campaign, EcoSport will be available in Ford showrooms as a stylish Titanium series featuring 16in alloy wheels (with alloy spare wheel and cover), front fog lamps, silver roof rails, power door mirrors, keyless entry and Ford PowerStart. Other standard features include remote locking, Thatcham alarm, Tyre Pressure Monitoring System, daytime running lamps, ABS, ESP, EBA, seven airbags, EATC, CD/radio with USB/aux in, multifunction leather steering wheel, power front and rear windows, rake/reach adjust steering, height/lumbar adjust driver’s seat, rake adjust rear seat and floor mats. Prices for this model will range from £14,995 to £17,495 on the road. There will be a choice of three engines - the multi-award-winning 1.0-litre EcoBoost offering 125PS and 125g/km CO2, the 1.5-litre petrol offering 112PS and 149g/km CO2 and the 1.5 TDCi offering 91PS and 120g/km CO2. The 1.5-litre petrol engine is available with either manual or Powershift transmission. The Ford EcoSport’s optional extras have been packaged together for customer convenience. There are four options - metallic paint, Ford SYNC with Applink, Rear Park Assist and a Titanium X Pack. The Titanium X Pack, priced at £1,000, contains leather seat trim, 17in alloy wheels, cruise control, automatic lights, automatic wipers and automatic dimming rear view mirror. 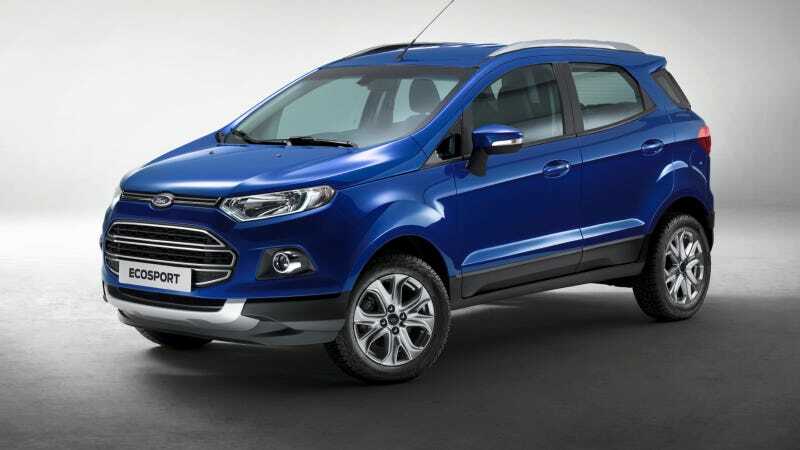 Ford EcoSport “Limited Edition”* and Titanium versions will arrive in the UK in spring 2014. A price list and customer order guide is attached.